More than just a 1960s fad, decoupage has been around for hundreds of years and enjoys periodic revivals. Simply the cutting and pasting of printed decoration combined with many layers of clear varnish, it served to imitate japanned furniture. In Italian the term 'lacca povera' - the poor man's lacquer - was used as the technique was cheaper than painted and japanned items. In the early part of the 18th century it became a very popular pastime for the wealthy, especially ladies, and contemporary accounts describe the inflated price of books of prints as demand grew. Printmakers even started to offer specialist prints in a variety of shapes and sizes specifically for the dÃ©coupage market. A large range of objects have been dÃ©coupaged: smaller items including boxes, trays and firescreens are likely to have been made by amateurs, but the larger pieces of furniture would be done by professionals. Although a simple technique, to achieve a good finish required experienced finishers. The papers were pasted down with flour paste: flour and water heated and continuously stirred until it turned into a sticky, translucent paste. Sometimes diluted animal glue was used. The surface was then varnished multiple times to create a hard glossy finish. The varnishes used were natural resin based, predominately the hard and light yellow resin sandarac. Cutting up Berchems, Watteaus, and Audrans: A Lacca Povera Secretary at The Metropolitan Museum of Art was a piece written by Danielle O. Kisluk-Grosheide, Associate Curator, European Sculpture and Decorative Arts at The Metropolitan Museum of Art. The piece refers to a letter written from Paris in 1727 by Mademoiselle Charlotte Aisse, to her friend and confidante, Madame Calandrini, in Geneva: 'We are here at the height of a new passion for cutting up coloured engravings... Everyone, great and small, is snipping away. These cuttings are pasted on sheets of cardboard and then varnished. They are made into wall panels, screens, and fire boards. There are books and engravings costing up to 200 livres; women are mad enough to cut up engravings worth 100 livres apiece. If this fashion continues, they will cut up Raphaels'. In her letter Mademoiselle Aisse referred to the decorative technique of decoupage, or decoupure as it was also known. In her essay, Kisluk-Grosheide refers to a number of decoupaged pieces which are housed at the Metropolitan Museum of Art, including a magnificent secretary dating to about 1730-35, a mid-18th-century candle stand in gilded walnut and pine which is carved, gessoed, painted, and as well as a recently acquired yellow-and-red papier-mache box from around 1755-60, which is completely covered with pasted-on scenes. Although small decorative objects, such as the box, which was most likely made in Venice as well must have been quite popular during the 18th century, few survive, thus making it a rare example. Kisluk-Grosheide also looks at decoupage in Italy and references a letter by an M. Constantin dated 15 December, 1727, explaining the art of decoupage to an unidentified marquise, and indicates that this pastime could be very expensive: 'Tapestry and knotting are no longer in question; one has left behind spinning wheels and shuttles; one wants nothing but decoupage. All kinds of furnishings suitable to this technique are being decorated; screens, folding screens, wall hangings, ceilings, the tops of coaches, and sedan chairs; it is being put everywhere. This fashion has made the prices of illustrations and prints rise to an extraordinary level; and although there are only a few dealers who sell or have these prints coloured, their shops are never empty'. It is not surprising that the art of decoupage still appeals today given its long history. John Derian is a name that has become synonymous with high-end decoupage. He created his first decoupaged glass plate in 1989, using reproductions of antique images, and each of his decoupaged pieces are still created by hand. 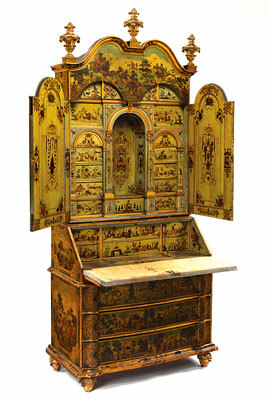 This writing cabinet or secretary was made in Venice in around 1730-35. A basic structure of pine (Pinus spp.) and limewood (Tilia vulgaris) has been enlivened with a multitude of coloured and varnished prints. There is a rich variety of figurative and decorative vignettes, from scenes of hunting to oriental fantasy and bucolic peasants in the landscape. Certain parts, including the finials and the feet, have been gilded to further enrich the surface. The yellow colour is partly a result of the degradation and yellowing of the sandarac over time. The precision and quality of the workmanship suggests it was made in a professional workshop.